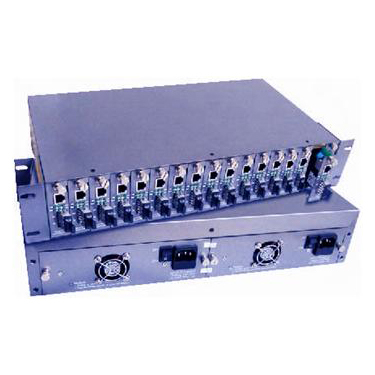 GAO Tek offers the 16 slot media converter chassis for sale to the United States, Canada and Globally. It is used with card-type media converters. It accepts 16 media converter cards within a rack-mountable chassis which is supplied with unified power. It features over voltage, over current and short circuit protection. The 16 slot media converter chassis reduces links, simplifies structure and eases management and maintenance. It can be powered by single power or dual power to meet the user’s application requirements. If a dual power supply is used, the load of each power supply is reduced and the life of the power supply is extended. If one power supply faults, the other one can work independently thus enhancing the reliability of the rack. In addition, 10/100M, 10/100/1000M converter cards can be plugged into it.